LG G Flex Curved Screen And Housing Self-healing: LG has officially announced its first phone curved, G Flex with 6-inch OLED screen and a design very similar to the LG G2, with back buttons. It goes on sale in November and its design is not all that surprising. Plus a huge battery has a single housing is repaired. The LG G Flex features a 6-inch OLED screen , 800 Snapdragon processor quad -core 2.26 GHz , 2 GB RAM, 32 GB of storage , 13 megapixel rear camera and a weight of 177 grams. On the software , uses Android 4.2 Jelly Bean and has double glazing for applications and terminal activation touching the screen , as is the case with the LG G2 . Unlike the Galaxy Round , the curvature of the LG G Flex is vertical rather than horizontal , so that fits the user’s face while talking on the phone , reducing the distance from mouth to microphone. 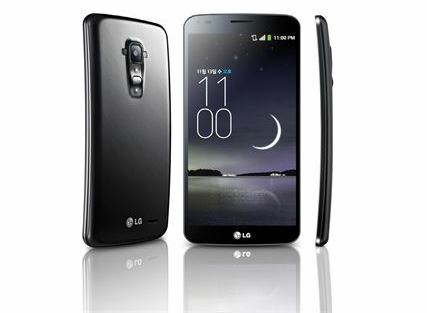 ” It is the best representation of how a smartphone should bend ,” said the president of LG , Jong – seok Park. According to the company , the shape of the device able to improve the sound quality by increasing the volume by three decibels . Also, by placing the phone horizontally the screen IMAX experience offers by LG is “the most comfortable angle to watch videos or play.” In addition, the G Flex also features the same button that the LG G2 rear to prevent the user from accidentally turn off the device. For the development of this terminal has been necessary to create a suitable curved battery with a capacity of 3500mAh . However, one of the most striking features is the back cover self-healing . According to the company , the elastic material is able to recover from minor bumps and scratches of daily use. The device will go on sale in South Korea from November to the three main operators in the country, although still unknown price and availability abroad.